This Kohlrabi Winter Salad provides all the freshness of a summer salad with crisp sprout leaves, crunchy kohlrabi and sweet juicy apple. While I usually steam or roast Brussels sprouts or grate them into salads, like in this fabulous Brussel Sprout Salad with cranberries and pecans, today I used the outer leaves as the base for this crispy Kohlrabi Winter Salad. I scattered some julienned kohlrabi on top, topped it with a mound of sweet julienned apple, and sprinkled it with some hemp hearts. A light dressing made with rice wine vinegar tied it all together. 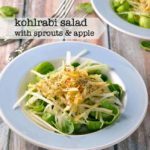 Crisp sprout leaves, crunchy kohlrabi and sweet juicy apple gave us all the freshness of a summertime salad on a gloomy January day. And then I sat back and felt downright righteous. I’d used in-season veggies and fruit . . . and items from the dark corners of my refrigerator. 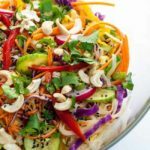 This Kohlrabi Winter Salad resulted from my quest to eat from my pantry and my freezer and use up as much as I can before I head out shopping again. I despise wasting food and letting it spoil or become freezer-burned Admittedly, I love the challenge of seeing what I can create using only what I have on hand. Denis and I call these my “Something From Nothing” meals. I’ve made two salmon dinners, one crusted with pistachios and the other with fennel both of which we loved. I also made an Asian-inspired soup with some miso broth that I found in my pantry, and today I made a small dent in my store of root vegetables with this Kohlrabi Winter Salad made with Brussels sprouts and apples. Using a julienne tool makes short work of cutting these winter vegetables. I have this one and this mandoline, both of which make julienne cuts super easy. 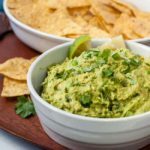 This recipe can be easily halved or doubled. 1 medium kohlrabi about 4 inch diameter, stem and root ends removed, peeled and julienned. Cut out the center core of the Brussels sprouts and remove as many of the fresh outer leaves as you can for the salad. Save the remaining part of the sprout for another use. 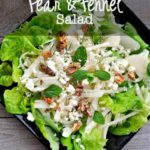 Arrange the leaves as the base of the salad. Remove the stem and root ends and peel the kohlrabi. Slice into matchsticks using a julienne tool or a very sharp knife. Core the apple, but leave the peel on for colour and fiber. Slice into matchsticks or use a julienne tool. Toss with 1 tablespoon lemon juice to prevent browning. 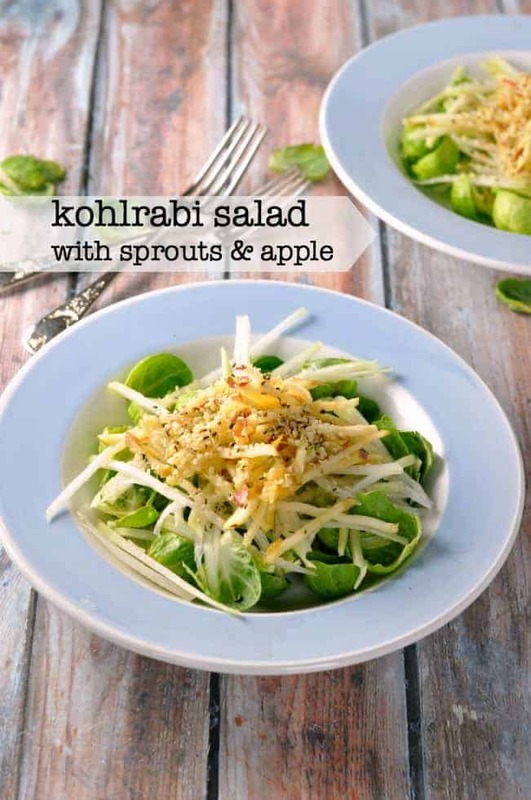 Arrange the kohlrabi and apple on top of the sprout leaves and sprinkle with hemp hearts. 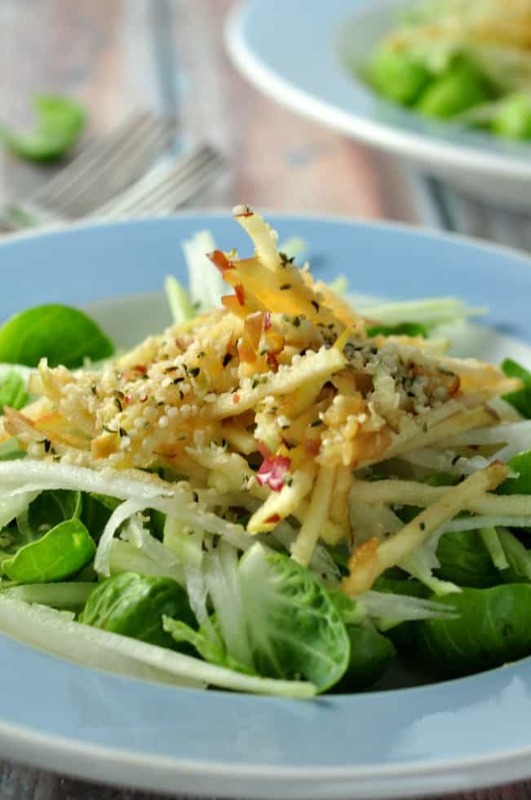 Whisk the vinaigrette ingredients together and drizzle over the salad just before serving. 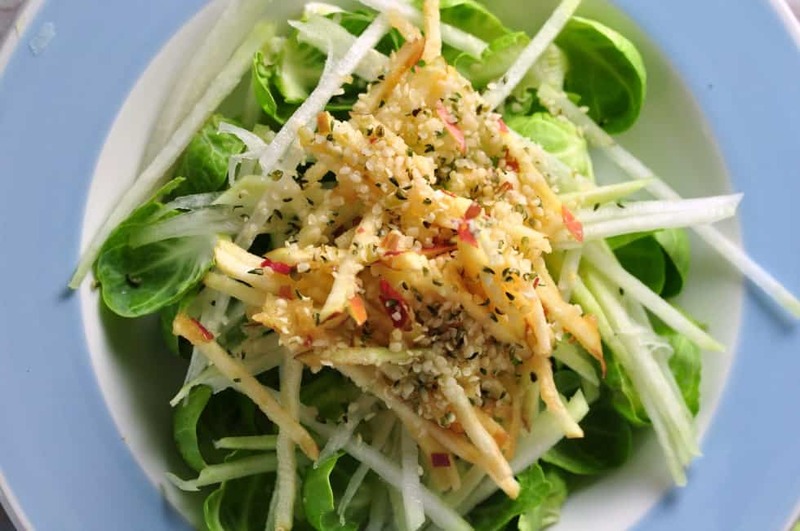 If you haven’t tried kohlrabi before, you might like these recipes, too. 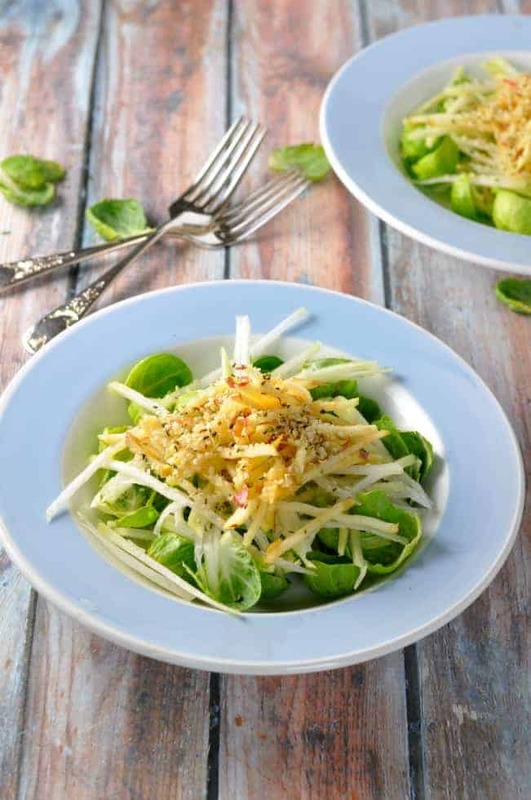 Like this Kohlrabi Winter Salad recipe? Please Pin it or share it! 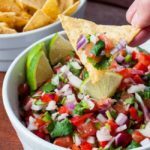 Subscribe to my weekly newsletter and never miss a recipe.